The Indian Government made compulsory to add or link Aadhaar card with Pan card during filling the Income tax return. Aadhaar and PAN number both are mandatory to filling the income tax return. Most of the person who don’t have Aadhaar card have to apply for Aadhaar card. Aadhaar card is very important document which is used for opening bank accounts, income tax return, loan, electricity, water, telephone and other things. 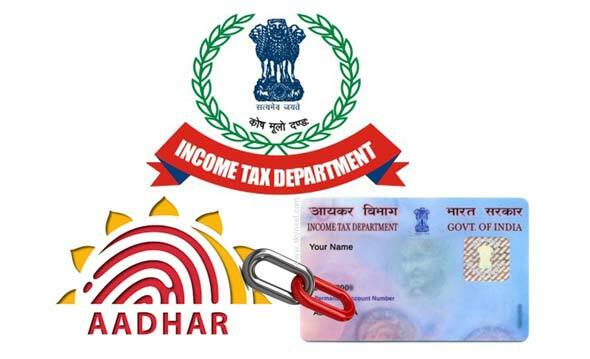 In this guide we have to discuss how to link Aadhaar card with Pan card during filling the ITR from Income tax portal. All we know very well PAN is an important ID proof of any person. PAN Stands for Permanent Account Number which is ten digit alphanumeric number. For example the number would be shown on PAN card in this sequence ARLMK0629Q. The sequence of 10 digit alphanumeric number is 5, 4, 1. First Five is alphabets, next four is the numbers and last 1 is any alphanumeric number. This laminated ID proof is used by the Income Tax Department to all those person who applies for it. This article helps you to know why PAN Card is Mandatory for these banking transactions. PAN card is an important ID Proof which is mandatory for different financial transactions. PAN is a unique identification number which is provided by the Income Tax Department. You can use PAN card for filling Income tax return, opening a bank account, receiving the professional fess, taxable salary, and other high value sales and purchase transactions. Aadhaar Card in an important individual identification number which is issued by the UIDAI (Unique Identification Authority of India) on behalf of the Indian Government. Aadhaar is a 12 digit unique identity number which is issued by the Indian Government based on bio-metric and demographic data. If you want to link Aadhaar card with Pan card during filling the ITR then you must have to take following given steps, have a look. Step 1: If you are a registered users of Income tax website then open the Income tax e filling portal. Step 2: Fill your registered user id, password and captcha code to open your account at Income tax portal. After open your account at Income tax e filling portal click on the Profile Settings. Now, click on the Link Aadhaar option from list of available options. Step 3: Fill the required necessary detail in the box and click on the Link Aadhaar button. Step 4: When you PAN successfully linked with Aadhaar card you will get an confirmation message. I hope after reading this guide you can easily link Aadhaar Card with Pan Card for filling the Income tax return. Hurry up and link your Aadhaar card with PAN number. If you have any query then please write us your suggestion in the comment box. Thanks to all.